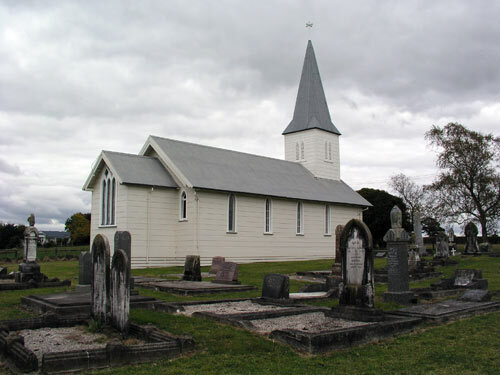 Built in 1856, St Paul’s Anglican Church is the only structure that remains from the once flourishing community of Rangiaowhia, east of Te Awamutu. During the 1840s and 1850s, both Anglican and Roman Catholic missionaries had churches here. Rangiaowhia was the centre of a Māori farming area, where wheat, maize and potatoes were cultivated for Auckland markets. As well as dwellings, there were flour mills, schools, stores and even a racecourse. War in the 1860s swept them all away.